Cloud Computing in Ocean and Atmospheric Sciences provides the latest information on this relatively new platform for scientific computing, which has great possibilities and challenges, including pricing and deployments costs and applications that are often presented as primarily business oriented. In addition, scientific users may be very familiar with these types of models and applications, but relatively unfamiliar with the intricacies of the hardware platforms they use. The book provides a range of practical examples of cloud applications that are written to be accessible to practitioners, researchers, and students in affiliated fields. 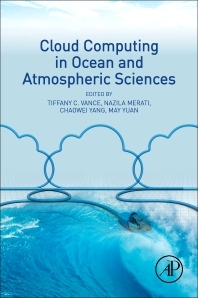 By providing general information on the use of the cloud for oceanographic and atmospheric computing, as well as examples of specific applications, this book encourages and educates potential users of the cloud. The chapters provide an introduction to the practical aspects of deploying in the cloud, also providing examples of workflows and techniques that can be reused in new projects. Primary: atmospheric scientists, climatologists, meteorologists, oceanographers. Tiffany C. Vance is a geographer working for the National Oceanic and Atmospheric Administration (NOAA). She received her Ph.D. in geography and ecosystem informatics from Oregon State University and her Masters in marine geology and geophysics from the University of Washington. Her research addresses the application of multidimensional GIS to both scientific and historical research, with an emphasis on the use and diffusion of techniques for representing three- and four-dimensional data. Ongoing projects include developing cloud-based applications for particle tracking and data discovery, supporting enterprise GIS adoption at NOAA, developing histories of environmental variables affecting larval pollock recruitment and survival in Shelikof Strait, Alaska, and the use of GIS and visualizations in the history of recent arctic science. She was a participant in the first USGS-initiated GeoCloud Sandbox to explore the use of the cloud for geospatial applications. Nazila Merati is an innovator successful at marketing and executing uses of technology in science. She focuses on peer data sharing for scientific data, integrating social media information for science research and model validation. Nazila has more than 20 years of experience in marine data discovery and integration, geospatial data modeling and visualization, data stewardship including metadata development and curation, cloud computing and social media analytics and strategy. She is the past chair of the Environmental Information Processing Technologies Conference of the American Meteorological Society where she organized sessions on cloud computing, crowdsourcing and social media for atmospheric research and GIS applications. She has received research funding for the rescue of oceanographic data and application of advanced technologies to oceanographic research. She received Masters in both fisheries oceanography and landscape architecture from the University of Washington. Chaowei Phil Yang is Professor of Geographic Information Science at George Mason University, where he founded the joint Center for Intelligent Spatial Computing and led the establishment of the NSF Spatiotemporal Innovation Center. His research focuses on utilizing spatiotemporal principles to optimize computing infrastructure to support science discoveries and engineering development. He acted as the NASA Goddard cloud computing chief architect. He is a leader of GIScience computing by proposing several research frontiers including distributed geographic information processing, geospatial cyberinfrastructure, and spatial computing. These research directions are further consolidated through his research, publications, and workforce training activities. He has received over $10M research funding for advancing these directions. He has published over 100 papers, edited three books and eight special issues for international journals. His spatial cloud computing paper published with International Journal of Digital Earth was one of the most cited articles and his book spatial cloud computing: a practical approach is used as text for graduate students in geography and computer science departments. He has placed six faculty members in the U.S. and over ten in other countries. May Yuan received all her degrees in Geography: B.S. 1987 from National Taiwan University and M.S. 1992 and Ph.D. 1994 from State University of New York at Buffalo. She is Ashbel Smith Professor of Geospatial Information Sciences in the School of Economic, Political, and Policy Sciences at the University of Texas at Dallas. Before she joined UT-Dallas in August 2014, she was Brandt Professor and Edith Kinney Gaylord Presidential Professor and Director of Center for Spatial Analysis at the University of Oklahoma (1994-2014). Her research interest expands upon temporal GIS and its applications to understanding geographic dynamics, including weather and climate. Over the years, she has been working to develop new approaches to represent geographic processes and events in GIS databases to support space-time query, analytics and knowledge discovery and promote cyber- and cloud-based GIS solutions for environmental, ecological, and social applications.